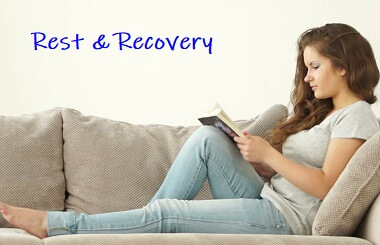 After an injury, it is advisable to rest the affected area for a few days to allow it to heal. Without rest, continual strain is placed on the area, which can lead to increased knee swelling, pain, and in some cases further damage. There is also a risk of the area not healing properly if it is not allowed time to recover. But how much is appropriate? Obviously it will depend on the injury, but usually a few days is about right and no longer than a week. By rest I mean avoiding any activities that increase your pain. Avoid putting too much weight through it or stretching it too much. If it hurts, that's often your body's way of saying you are overdoing it. But that doesn't mean you should take to your bed! Complete rest can actually be counter productive. It's all about moderation. And you don't go from doing nothing straight back to trying to do everything. Pacing is really important. Can I Rest Too Much? YES! It is REALLY important to get moving again after a few days otherwise the muscles start to weaken and the joint stiffens. As things are healing, the right stresses and strains need to be put through the area to help it heal properly. If a muscle isn't being used at all, it loses 3-5% of its strength every day. Therefore in 3-5 weeks a muscle loses half its strength. You may not initially realise that the area is getting weak as you tend to lose endurance strength first, how long the muscle can keep working for, before instantaneous strength, how strong the muscle is for a short period. However it takes much longer to get strength back. To increase muscle strength by 10% takes about sixty days. How Do I Avoid Losing Strength? You can maintain muscle strength without aggravating an injury with some simple exercises. By tensing the muscle without moving the joint, known as an isometric contraction, for several seconds a day, you can maintain muscle strength. You don’t have to work the muscle as hard as you can, you only need to work it at about 20-30% of its maximum (i.e. think about how hard you could tense the muscle and just do about one third of that). Check out the knee exercise section for appropriate exercises to do in the early stages following an injury. This is just one part of the PRICE treatment plan (Protect Rest Ice Compression Elevation). For more ideas on recovering from an injury, visit the knee pain treatment section. If you want some help working out what is causing your problem, visit the knee pain diagnosis section.